Oh my…it’s the end of Week 3 already at Create with Connie and Mary Holiday Collection 2014 and it’s time for for another design team blog hop. On Sunday through Friday only our subscribers can see the AMAZING projects for Christmas/Winter but on Saturdays our design team members join up to do a fun blog hop! We feature the set we used for out project that week! If you are going forward through the hop you arrived here from Amy White’s blog. What a GREAT card! I LOVE the Ornament Pine set….yep I mean LOVE!!! I used this set for my project this past week (oh…and I have to say…I LOVED my project from this week) so I used the set for my card. This is based on a card I did at my recent Christmas Card class…hmmm…maybe I’ll show that another day! To me there is NOTHING classier than vanilla and gold! So simple! Very Vanilla – 4 3/4 x 3 1/2. Stamp greeting in Versamark and Gold Emboss. Gold Foil – 4 7/8 x 3 5/8 – I cut the cent out leaving a 1/2″ ‘frame’ outside and then add the Vanilla to the frame. Vellum cardstock – 4 3/4 x 3 1/2. 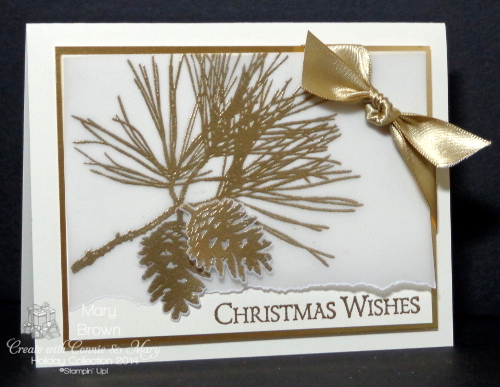 Stamp pine bough using Versamark and gold emboss. Rip bottom and add to Vanilla layer (hint…I hide the tape behind the embossed area. Tie knot in piece of gold satin ribbon and add to corner. Add panel to card base using dimensionals. Stamp pine cone twice on Vellum cardstock, gold emboss, cut out and add to card. The one is added sing dimensionals. 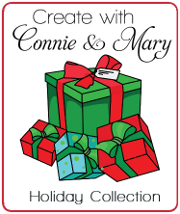 We have just finished week 3 of Create with Connie and Mary Holiday Collection 2014! We are featuring the Christmas/Holiday (no Halloween/Fall) products from the Holiday Mini! Now it is time to head over to Melissa Davies and her Rubberfunactics blog! She has something wonderful in store for you! This entry was posted in Clean and Simple (CAS), Create with Connie and Mary, Holiday Mini and tagged Ornamental Pine. Bookmark the permalink. Simply gorgeous Mary!!! I am totally getting this set!! Your Holiday project from this week was out of this world!! Very pretty and elegant card Mary! That card is beautiful Mary – very classy!